It is a constant struggle trying to keep my kids hydrated and away from the overwhelming number of sugary and unhealthy drinks that line store shelves and tempt consumers. They get so tired of plain water, so here are some healthy alternatives that we experimented with this summer. Of course, it is crucial to make sure that your family is drinking water every day, but for some variety, try these ideas and beverages that are better when it comes to satisfying that urge for a flavored drink. Manic: My kids begging me for sugary sodas and unhealthy beverages! Managed: Did some experimenting this summer and my girl and I came up with some ways to spruce up plain water and some better alternatives to soda and sports drinks. And I threw in a tasty and low calorie cocktail recipe for us Moms, too! 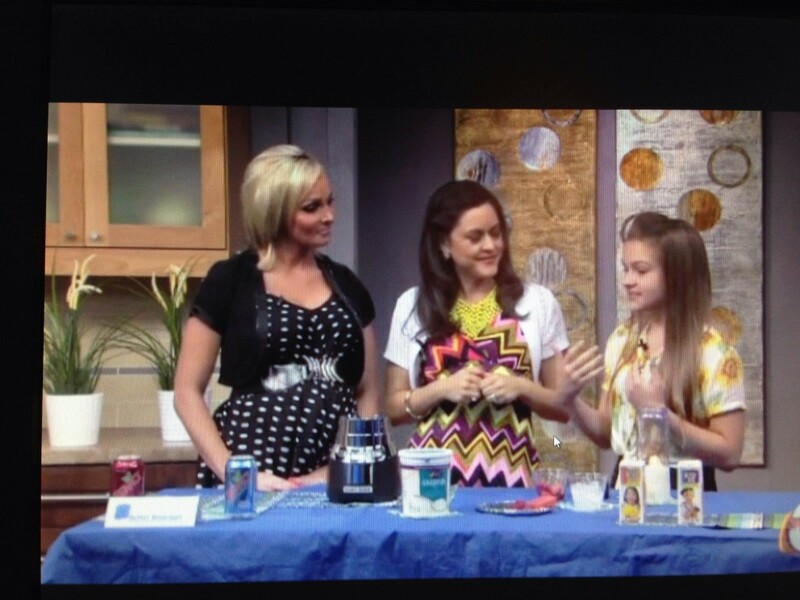 Check it out and a huge thanks to my girl for her help in the segment. She did a great job…. *Create fun and flavorful fruit ice. Let the kids get creative and fill an empty ice tray with slices of fruit mixed with water such as watermelon or strawberries. If the kids fill the tray and see the end result that is a pretty filled frozen cube, chances are they will want to drink their creation and the fruit naturally flavors the water. *Serve it cold. It never fails. When I put out my own icy water, my teenager usually slurps it down right then and there. So make the glass of water enticing with lots of ice or place it in a cup that will keep it cold. For example, I like the Koolio Premium Personal Beverage Cooler ($9.99 at www.koolio.com) that is a freezable gel pack that is kept in the freezer. When removed from the freezer, it holds a water bottle (or can) and the beverage will be kept chilled, which encourages my kids to finish that water bottle. *Try cucumber or mint leaves to spruce up the water…but the trick is to let the kids place the cucumber slice or the mint leaf in the water. Chances are if they create it, they will like it more than if you made it. *Play restaurant with smaller kids (my kids loved to do this when they were younger) and encourage them as “waiters” to add a little natural flavor to the water with the cucumber slices, etc. *My kids complain about this, but most of the time I only keep water and milk in the house so the temptation is not there to drink something sugary and unhealthy as opposed to the water that their bodies need. *Avoid sports drinks unless it is truly needed to replace electrolytes after a big game or extended time in an outdoor or indoor physical activity. Most of the time, those kinds of drinks aren’t really needed when water is truly what the body craves. Both my dentist and my pediatrician call those drinks sugar water and have told me to avoid them on a regular basis, so I do. I realize that I can’t make my kids drink only milk and water 100% of the time, so here are some options that we all agree on that I think are better than soda, which I say no to 98% of the time. *Instead of soda, try Zevia which is sweetened with stevia instead of sugar. This soft drink that tastes just like a cola has no sugar and no artificial sweeteners. Some of the flavors do have caffeine and this isn’t a so called healthy drink, but it is a good option for a special occasion soda for kids. My tween says that the Dr. Zevia tastes like Dr. Pepper and the Zevia cola tastes like Coke. She says that the Zevia root beer and ginger ale does not taste like the real thing, so she doesn’t like those particular flavors. Zevia is sold at Sprouts Farmers Market and Safeway. *Little Me Tea (found in store beverage aisle by juice boxes) was invented by a mom who wanted a healthier alternative to traditional kids’ juice boxes that were loaded with sugar. So Melinda Hicks created this USDA organic, caffeine free, gluten free beverage that is an antioxidant blend of white, Rooibos, Chamomile and Hibiscus teas sweetened only with fruit and vegetable juices. With only 6 grams of sugar in one Little Me Tea, that is far less sugar than most kids’ juice boxes. Little Me Tea comes in two tasty flavors that include Julia’s Tropical Tea and Zane’s Grape Tea. Lexi also makes smoothies with plain nonfat Greek yogurt, a little stevia and fresh berries. One thing that impressed me was that she looks for what we have on hand and experiments from there, which encourages her to use whole foods that we have already purchased. This is healthy and budget conscious and I appreciate that she is thinking about both aspects when working in the kitchen to create a nutritious drink that is also tasty. Looking for a light and refreshing summer cocktail to serve? Try this easy and quick recipe that calls for Sparkling Ice, which has zero calories and contains vitamins and antioxidants. Here is the recipe….